The main goal of our #SpotCancer campaign is to promote the importance of skin cancer prevention. We will educate people about the dangers of UV exposure, whether it’s foggy or sunny! We will give out free sunscreen samples to members of the public.  If you have a mole you want to have checked out, we will also be providing free screenings using our smartphone technology, we hope that we can make an impact on the increasing prevalence of skin cancer. What do these screenings entail? Trained volunteers will use the First Derm app and iPhone dermoscope / dermatoscope to take images of suspicious moles. Our remote dermatologist team will then look at the images and send back an answer on the next steps to take. Every year, 1 in 10 people screen at First Derm’s #SpotCancer events finds out that they have possible skin cancers. 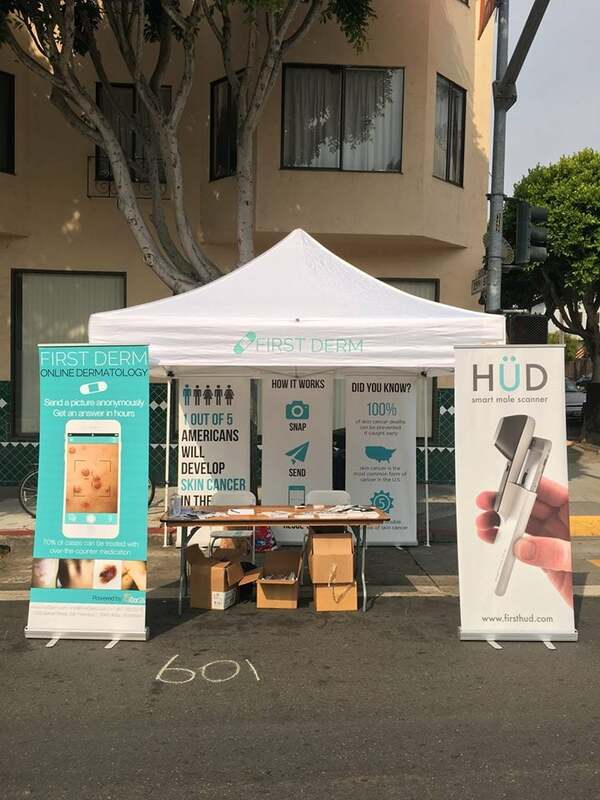 On Sunday, July 16, 2017, First Derm hosted the 6th annual Spot Cancer campaign at Sunday Streets SF. The objectives were to raise awareness about skin cancer, promote sunscreen and screen people with any worrying spots. The event is paid for by First Derm and sunscreen samples were sponsored by our partner Blue Lizard. Ask a dermatologist today and get feedback within hours! This year, 5 members of our team participated. We distributed 1,500 samples of Blue Lizard Australian formulated sunscreen. 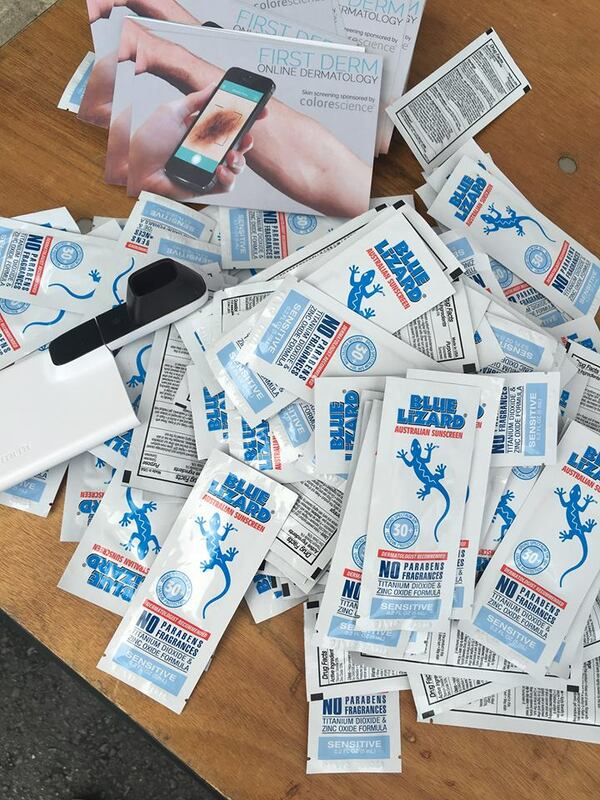 Upon the handout, a First Derm team member would educate that person about the importance of daily SPF usage and the benefits of the Blue Lizard sunscreen. We spoke to about 2,000 people and had amazing feedback. Many people were grateful that we handing out sunscreen on a hot day like this. How does this work exactly? Possible skin cancer lesions (moles, growths, pigmented lesions, etc) are photographed with the smartphone camera (overview) and using the HÜD smartphone dermoscope (essentially a medical-grade illuminated magnifying glass) attachment for a close up. These images along with the user’s description of relevant symptoms such as growth or color change, are provided to our team of board-certified dermatologists trained in dermoscopy. From this information, our dermatologists provide users with a sound opinion about the severity of the lesion. Our dermatologists also educate the user on the warning signs of skin cancer and best practices for sun safety. 26 females and 11 males with an average age of 42. We had individuals between the ages of 5 and 72 years. The median age was 45 years old. First Derm users take this information and seek immediate treatment, bypassing gatekeepers such as the family doctor or the 32-day wait list to see a dermatologist. First Derm believes that the battle against skin cancer is best fought with prevention and early detection. This begins with education about skin cancer and the effects of the sun. It continues with regular and diligent skin screenings. Keep making your pledges to be sun safe and wear sunscreen 365 days this year. Also stay tuned on Facebook and Twitter more #SpotCancer updates and events from team First Derm. 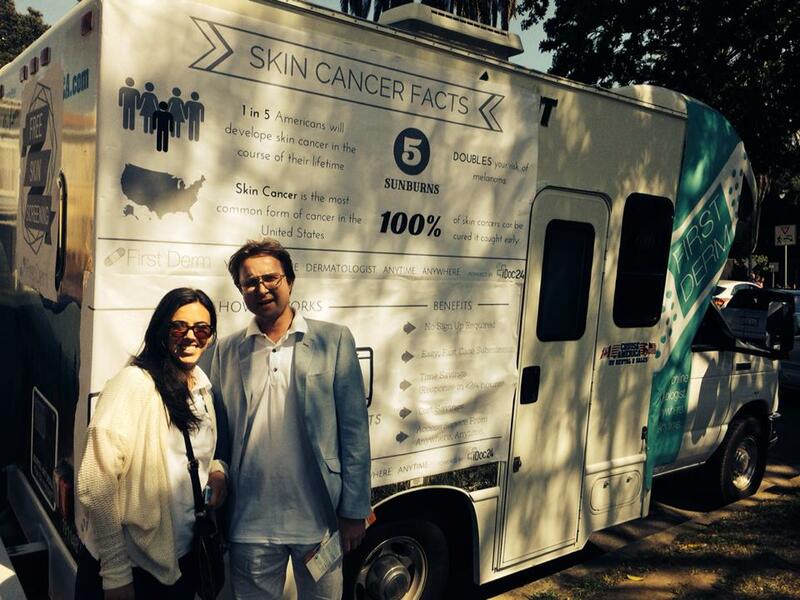 First Derm #spotcancer events have a 10% conversion rate on possible skin cancers. These are found on people that randomly come up to us at these events and have a mole they have not have had a chance to get checked out by a doctor. 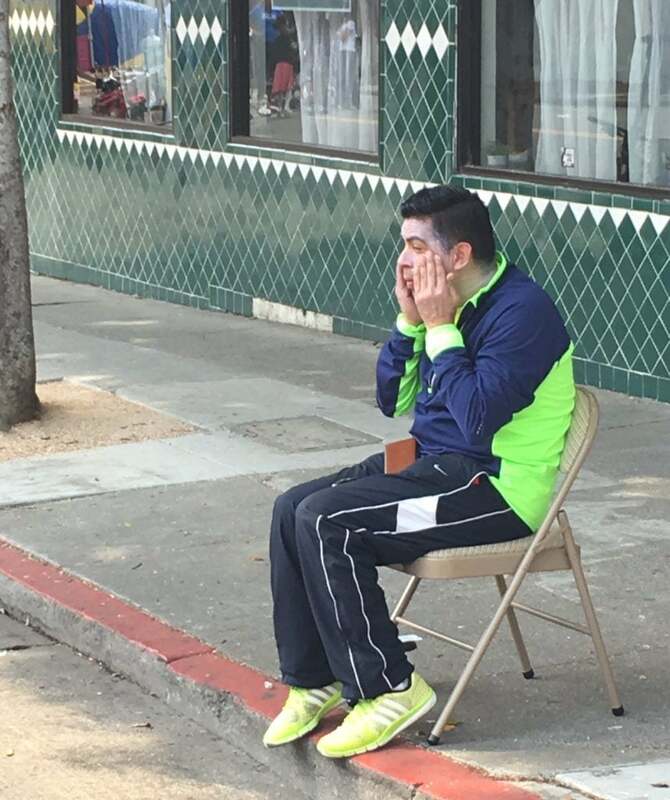 On Sunday, August 21, 2016, First Derm hosted the 5th annual Spot Cancer campaign at Sunday Streets SF. The objectives were to raise awareness about skin cancer, promote sunscreen and screen people with any worrying spots. The event is paid for by First Derm and sunscreen samples were sponsored by our partner Blue Lizard. Three First Derm team members and 2 volunteers participated. We distributed 3,000 samples of Blue Lizard Australian formulated sunscreen. 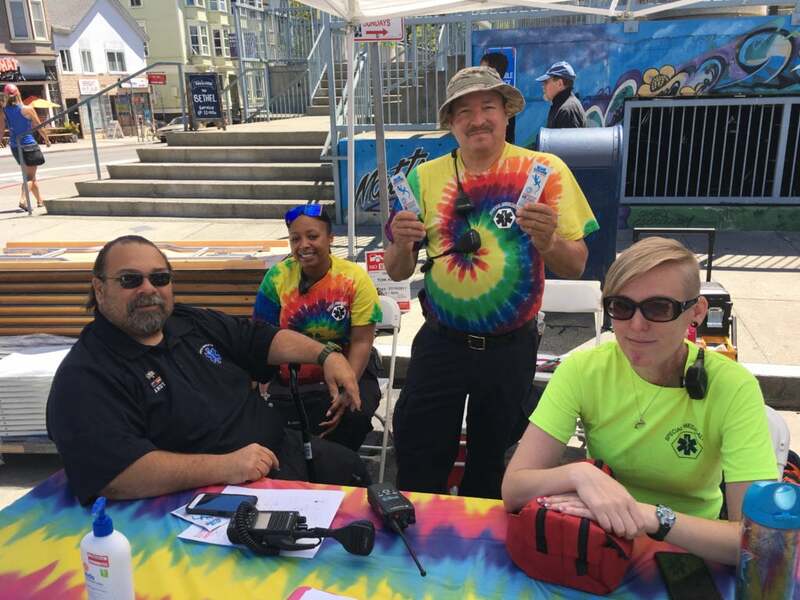 Upon the handout a First Derm team member would educate that person about the importance of daily SPF usage and the benefits of the Blue Lizard sunscreen. We spoke to about 2,000 people and we had amazing feedback from members of the public, that we handing out sunscreen on a hot day like this. Results from the weekend: 39 people were screened with First Derm and HÜD. Our dermatologists identified: 39 people’s skin lesions: 23 females and 16 males with an average age of 31 years. We had individuals between the ages of 9 and 75 years. The median age was 46 years old. First Derm users take this information and seek immediate treatment, bypassing gatekeepers such as the family doctor or the 29 day wait list to see a dermatologist. Here’s a video from our Last Spot Cancer event in Mission Dolores Park! First Derm is on a worldwide mission to #SpotCancer. Last weekend, we kicked off National Skin Cancer Awareness Month in Kansas City, Missouri, Montreal, Canada and Gothenburg, Sweden. In just under 48 hours in three separate countries, the First Derm team screened nearly 100 people and spotted two probable melanomas. The first goal of #SpotCancer is to educate people about the dangers of the sun. The facts about skin cancer are shocking: 1) each year, there are more new cases of skin cancer than the of breast, prostate, lung and colon cancers combined and 2) suffering from just five sunburns doubles your risk of developing skin cancer. It is vital to protect your body from the sun’s harmful rays by seeking shade, covering up with sun protective clothing, and following the guidelines of the American Academy of Dermatology for proper sunscreen use. 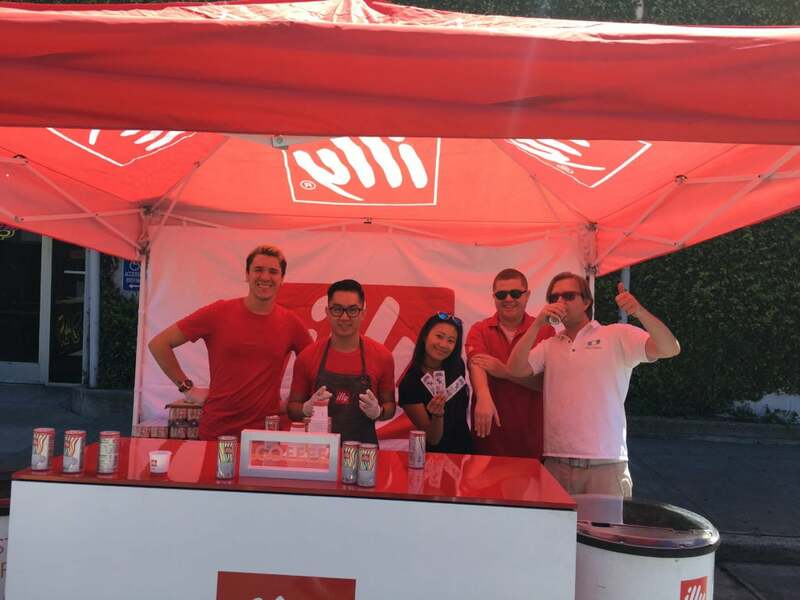 At each #SpotCancer event this past weekend, we gave away thousands of sunscreen samples thanks to the generous donation of our sponsor, Person and Covey. 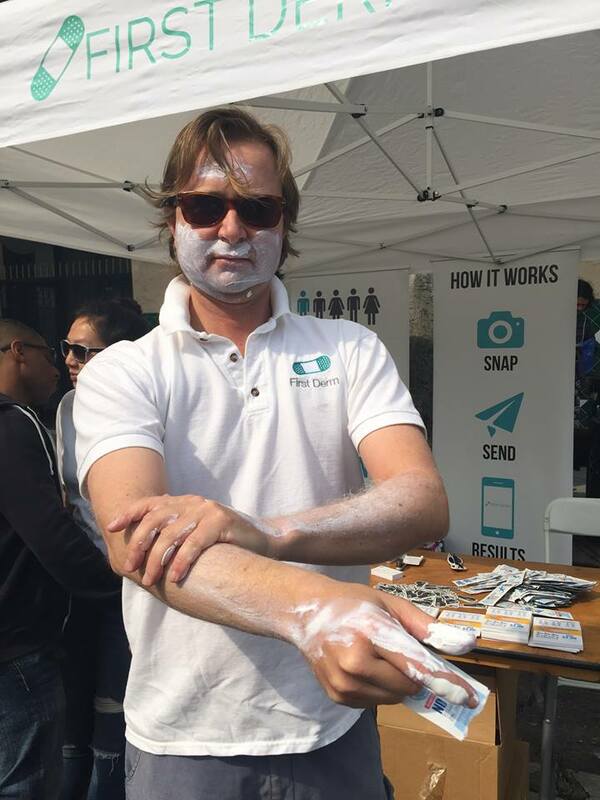 The second goal of #SpotCancer is to show the power of our mobile app as a triage service for any skin condition. First Derm complements a yearly dermatologist’s screening and monthly self-exams. Mobile health technology like ours isn’t meant to be a replacement for a dermatologist, but an intermediary service. Check out our new video to see just how the app works to identify skin lesions that should be quickly evaluated and treated by your dermatologist during an in-person appointment. Saturday March 21st & Sunday March 22nd, 2015 11:00 AM through 4:00 PM. Mission Dolores Park in San Francisco, California. The main goal of our #SpotCancer in the Park campaign is to promote the importance of skin cancer prevention. We will educate people about the dangers of UV exposure, whether it’s foggy or sunny! We will also be providing free screenings for any skin concern you may have. Using our smartphone technology we hope that we can make an impact on the increasing prevalence of the disease. We will give out free sunscreen samples to members of the public thanks to our sponsor, Colorescience® and Blue Lizard®. We also provide free skin cancer triaging screenings. What do these screenings entail? Trained volunteers will use the First Derm app and iPhone dermoscope to take images of suspicious moles and skin lesions. Our dermatologist team will then look at the images and alert people to the lesions they should be concerned about. This event is made possible by the generous donation of our sponsor, Colorescience® and Blue Lizard® Sunscreen.